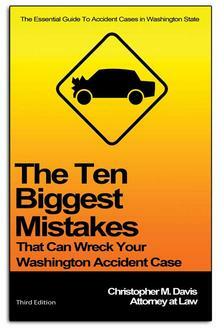 There are many laws regarding hit-and-run drivers in Washington state. If you are a victim of one, there many be some options out there for you to recover compensation for medical bills, loss wages and more. According to RCW 46.52.020, Washington state requires a driver to stop their vehicle if they they’re involved in an accident which results in an injury or death. Even if the driver is not as fault and you‘re involved in a auto collision with another vehicle, you must stop at the scene. A driver must remain at the scene until they have gathered the following information; name, address, insurance policy, insurance company, and the vehicle license plate number. The drivers of the vehicles involved should exchange their licenses and write down each other’s information. If any parties involved are injured you should assist them until help arrives. Failing to not stop after you were involved in a hit and run could result in a class B or class A felony. A class B felony could lead up a sentence of 10 years in prison and a $20,000 fine. A class C felony could result in a penalty of 5 years in prison and a $10,000 fine. Seeking help from a personal injury attorney with experience handling auto accident case can benefit you to your recovery if you were injured in a hit and run collision. Contact an experienced car accident attorney today. The attorneys at Davis Law Group can help you. Schedule a free consultation today by calling (206) 727-4000.